MacBook Pro models with Radeon Pro Vega graphics, allowing the higher-end machines to be purchased at a discount. Apple announced plans to add AMD’s Radeon Pro Vega graphics to its MacBook Pro lineup in October when the new MacBook Air models were announced. MacBook Pro models with the new options were able to be purchased in November. Only the higher-end 15-inch MacBook Pro can be upgraded with the Radeon Pro Vega 16 (+$250) or Radeon Pro Vega 20 (+$350), so purchased new, machines with the new graphics options are priced starting at $3,049. Apple has a wide selection of MacBook Pro models with Radeon Pro Vega 16 and 20 graphics available. One of the most affordable options, which is a Core i9 model with the Radeon Pro Vega 16, 16GB RAM, and a 512GB SSD, is priced at $2,849, a $500 discount. A base level Core i7 model with 16GB RAM, 512GB SSD, and the Radeon Pro Vega 20 is even cheaper at $2,679, a $470 discount. There are a number of MacBook Pro configurations available with different RAM, SSD, and processor upgrades, all of which are equipped with the new graphics cards. With the wide range of configurations available, people looking for a discounted MacBook Pro with the Radeon Pro Vega should be able to find what they’re seeking with today’s update. 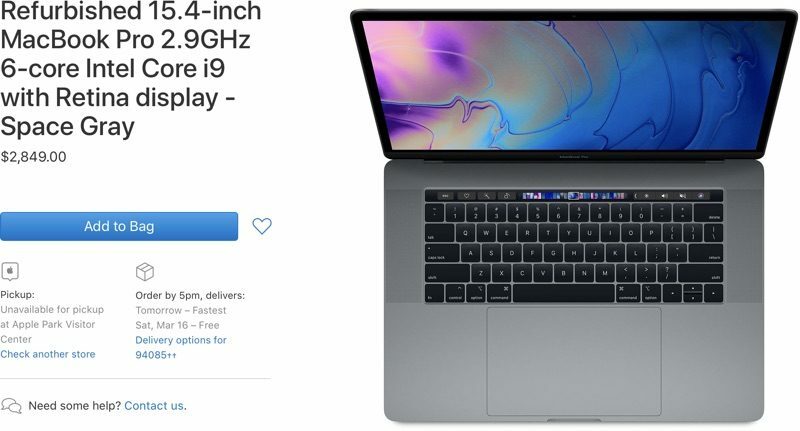 Apple even has a maxed out MacBook Pro with Core i9 processor, 32GB RAM, Radeon Pro Vega 20, and 4TB SSD for $5,989, a discount of $1,060. Apple’s refurbished stock does fluctuate, however, so available stock of refurbished MacBook Pro models could sell out quickly. Apple refreshes the refurbished store on a regular basis, and it can be handy to keep an eye on a tool like Refurb Tracker to find specific configurations. All of the available MacBook Pro models are listed on Apple’s refurbished site. Purchasing a refurbished MacBook Pro from Apple is a good way to get a like-new device at a lower price point. All of Apple’s refurbished products are tested, certified, cleaned, and guaranteed with a one-year warranty that can be extended with AppleCare+.